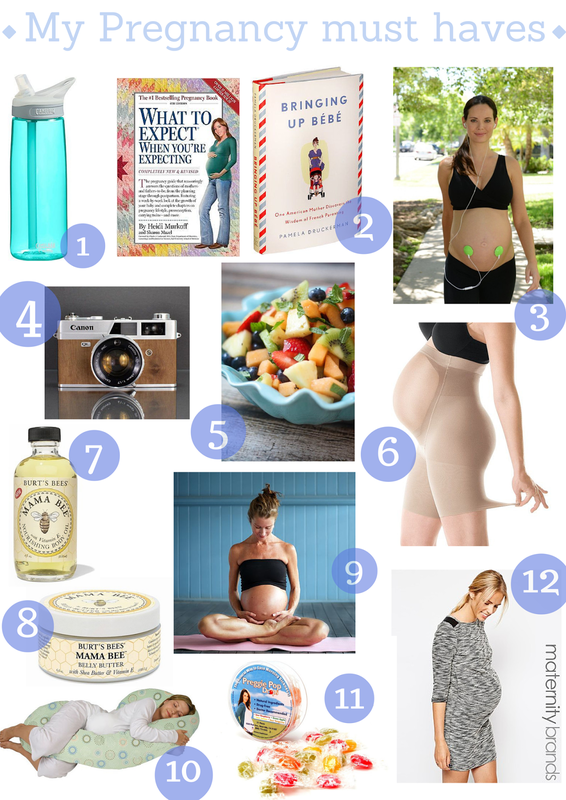 I decided to do a post on my pregnancy must haves thus far. I am currently 21 weeks and 5 days pregnant and there are somethings in this post that I couldn’t live without. Things that just made life a little bit easier and somethings i just love! Here you go! 1. Water bottle - Make sure you drink lots and lots of water! Yes it will make you pee more but water is necessary during pregnancy, it is very important to stay hydrated! They say to drink about eight 8-ounce glasses per day - I just found it easier for myself to fill up a water bottle every time it ran out. Water helped with my headaches and cramps! 2. Pregnancy & Parenting books - Since I found out I was pregnant I began to read about pregnancy and just started reading about parenting. I love What to expect when you are expecting. This book has answered so many questions I have - Whenever I am feeling a certain way or experiencing something I open the book up to the week that I am at and it settles my wondering mind. This book is week by week guide through pregnancy and what you can expect from your changing body all the way up until the point of delivery. I just started readingBringing Up Bebe: One American mother discovers the wisdom of french parenting. Now is a perfect way to get ready for your new life and there`s plenty of parenting books out there, just find one that best fits you! 3.Belly Buds: These aren’t a must have but they are fun! Chris bought me these a couple weeks ago so I could play music into my belly. I play classical music, they say it creates an almost lullaby style sound in the utero. Sometime I will play some of Mommy and daddy’s favorite songs for our little boy. He tends to kick more when I do! 4. Camera - whether you use your Iphone camera or digital camera it is important to start documenting your pregnancy. I started taking pictures right away! It`s exciting to look back and see how far my belly has grown! I can’t wait to look back years from now and share this moment with my boy. I think it’s a great idea to invest in a good digital camera, once the baby enters the world you can take great newborn pictures, pictures through out babies 1st year and 1st birthday pictures. Photographers can get pricey and you can do just as good of a job with a decent camera and an easy photo editing app! 5. Fruit! - I sure do love my fruit!! Fruit has been one of my favorite things through out my pregnancy - one of my cravings! Since the beginning I would run down to the grocery store buy every fruit possible and make fruit bowls every other night. I think in the beginning it was easiest for me to eat because of the morning sickness. Plus fruit is a great way of getting all those vitamins your baby needs! 6. Power Mama Spanx - These have saved me!! Your body goes through lots of changes during pregnancy. The first trimester can be hard with morning sickness and fatigue so getting to the gym or a yoga class just doesn’t happen! I gained cellulite and a few rolls here and there. Power Mama Spanx really help me cover those areas right up!! One of the items I could not live without during pregnancy! 7. & 8. Burt’s Bees mama bee oil & Belly Butter - They say The oil & belly butter help to reduce stretch marks so I started early! I lather up my belly, hips, under my arms, inner thighs and outer thighs. I like the body butter a little more it is hydrating and both are safe to use during pregnancy. I apply after my morning shower and before bed. These both help relieve an itchy growing belly as well! 9. Prenatal Yoga - MUST DO! not so much a must have but a MUST DO! I love doing prenatal yoga! Like I said earlier the beginning of pregnancy can be tough on some and getting to the gym or yoga was tough for me to get to. I was experiencing morning sickness in the middle of the day and tired all day. Im not tired during the day anymore but get extremely tired early in the night. I started doing prenatal yoga which is a perfect pregnancy exercise it is both relaxing and also great for strengthening muscles and getting you ready for delivery. I have had sciatica which yoga has helped with and now I am experiencing hip pain while sleeping. I find the days I take class it really helps with the hip pain! buy a prenatal yoga dvd and do it at home or get to a class in your area, it`s also a great way to meet other soon to be mommies! 10. Snoogle Pregnancy Body Pillow - I got one of these in the beginning of my pregnancy and it just sat around in the corner of our room for the first few weeks until about last week! Boy does this pillow do wonders! People don’t lie when they say you get no sleep during pregnancy- First the constant trips to the bathroom through out the night then you begin experiencing discomfort at night. Sleep is awful for me at this stage. I am so uncomfortable, some nights this snoogle does wonders for me! Other nights nothing helps but thats just how it is! Sometimes I sleep on a 45 degree angle with 3 pillows under my back, pillows all around me and the snoogle under me knees. Other nights I wrap myself around the snoogle like the picture above. This pillow supports your belly - helps with heat control and supports your body through out the night. THIS IS A MUST HAVE! 11. preggie pops - I used these in the first few weeks of pregnancy to help with my morning sickness - They came in an assortment of flavors; sour raspberry, green apple, sour lemon & sour tangerine. They helped they didn’t relieve me from morning sickness. 12. ASOS Maternity - As your belly grows you start to grow out of all of your clothes - I had to buy maternity clothes and in the beginning had a hard time finding cute and comfortable maternity clothing! Then I came across ASOS Maternity. They have the cutest and most affordable Maternity fashion. I go there for anything that I need. Dresses, Jeans and Sweaters! There’s a lot of pieces I have purchased that I can continue to wear when I am not pregnant.